Final Year Project in Performance Mode. This project spanned over the entire final year of my undergraduate degree, and was one of the most important parts of it. It consisted of developing a final product, and a writing a cited report on the background research, development and conclusions of the overall project. to be controlled by human vocal input in real-time. This involves the real time processing and analysis of vocal input, and the use of this to perform and control a musical piece. lters, all with controllable parameters. If you would like to read the full report, including appendix screenshots and references, it is available for download here. 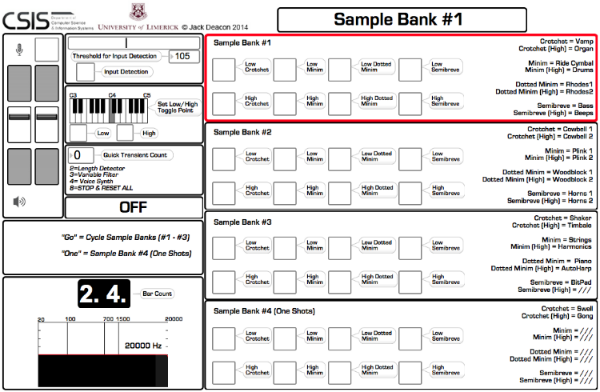 The full Max/MSP project download is available on the Cycling ’74 website. Cycling ’74 are the creators of Max. This project was featured on their social media pages on the day it was submitted to their site, and is currently (at time of writing) the 4th overall most popular project on their site.